New Polymer Nanocomposites for Environmental Remediation summarizes recent progress in the development of materials’ properties, fabrication methods and their applications for treatment of contaminants, pollutant sensing and detection. 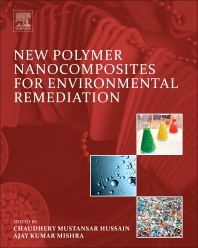 This book presents current research into how polymer nanocomposites can be used in environmental remediation, detailing major environmental issues, and key materials properties and existing polymers or nanomaterials that can solve these issues. The book covers the fundamental molecular structure of polymers used in environmental applications, the toxicology, economy and life-cycle analysis of polymer nanocomposites, and an analysis of potential future applications of these materials. Recent research and development in polymer nanocomposites has inspired the progress and use of novel and cost-effective environmental applications. Chaudhery Mustansar Hussain, PhD is an Adjunct Professor, Academic Advisor and Lab Director in the Department of Chemistry & Environmental Sciences at the New Jersey Institute of Technology (NJIT), Newark, New Jersey, USA. His research is focused on Environmental management, Nanotechnology & Advanced Materials, and Analytical Chemistry and Various Industries. Dr. Hussain is the author of numerous papers in peer-reviewed journals as well as prolific author and editor of several scientific monographs and handbooks in his research areas. Ajay Kumar Mishra is a Research Professor in the Nanotechnology and Water Sustainability Research Unit at the University of South Africa. His primary research interests are in nanoscience and nanotechnology, materials science, polymers, composites/nanocomposites, and water research.